In 1853, on one of his European tours, Stephen Salisbury II (1798-1884)- father of the Museum's founder- visited the American neoclassical sculptor Thomas Crawford at his studio in Rome. Crawford, who had lived in Rome for almost twenty years, welcomed many American tourists. His reputation in the United States, and especially in New England, was greatly enhanced by the exhibition in Boston in 1844 of his sculpture Orpheus, which had been inspired by the renowned Apollo Belvedere, a centerpiece of the Vatican's rich collections of ancient art. During his stay in Rome, Salisbury selected this subject from the many plaster maquettes (models) he saw in Crawford's studio. 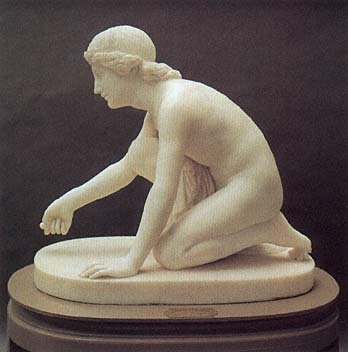 With the help of his studio assistants who carved the piece in marble, Crawford transformed the prosaic activity of a boy shooting marbles into a graceful, elegant composition. The supple, curving silhouette of the human form is enhanced by the sensuous surfaces of the polished marble. The classical details of the draped garment and disheveled hair tamed by a headband clearly indicate that Crawford drew inspiration from sources from antiquity.